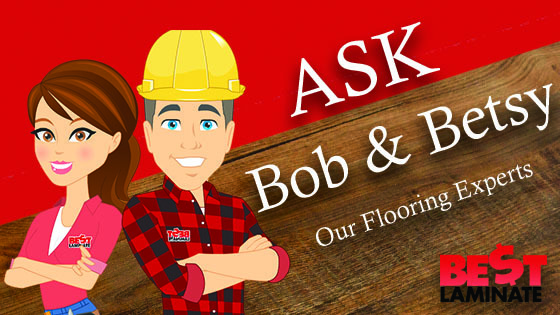 Home >> Ask Bob & Betsy Series >> Can I Use Cork Underlayment Under Pre-Attached Underlayment? I’ve heard that cork underlayment can be used under laminate flooring. I found a floor I really love, but it has underlayment already attached. Can I use cork underlayment under pre-attached underlayment? Laminate with attached padding (underlayment) can be confusing to many DIY installers. You read articles touting the importance of using underlayment for moisture control, noise reduction, and overall support. It’s natural to wonder what you should do to maximize your floors longevity when the underlayment comes pre-attached. Most underlayment provides extra padding on a floor. Using cork underlayment under pre-attached underlayment poses the same risk as having two layers of underlayment. By adding unnecessary cushioning, you could actually be causing more harm to your floor than good. The added friction could cause the underlayment to wear down quickly and make your floors less stable over time, causing stress on the floating floor’s locking system joints. There is an exception to this rule – a film vapor barrier. If you are installing your laminate flooring with the pre-attached underlayment over a cement subfloor, you will want to use a vapor barrier. This type of underlayment does not have any additional padding, so it will not pose a risk to your laminate flooring. We recommend using our Visqueen 6mil PE Vapor Block PE Film in these situations. You can be sure that no moisture or other damage will occur with this option under a pre-attached underlayment. As you can see, there are many factors to take into consideration when installing your laminate flooring. From subfloors and underlayment, to the type of laminate flooring you buy, you must weigh everything equally to get the best results. If you have any further questions, please do not hesitate to reach out to any of our flooring experts for help. We’re here to make your installation as easy as possible. We found a 7mm laminant floor that we like and want to install throughout our house. (1000sq.ft.) all concrete floor. Should we consider a better more expensive/ quality underlayment w/vapor barrier, since the 7mm laminant is thinner? Hi Mark, thanks for your question! You will want to get an underlayment with a vapor barrier since you are installing over concrete. You do not need to get the most expensive underlayment, but there are several options that will give you a nice cushion, sound reduction and vapor protection. Since your floor is only 7mm, we’d recommend staying with something at 2mm or 3mm. Here are some options for you to look at: https://www.bestlaminate.com/vapor-3-in-1-underlayment-silver-100-sq-ft-roll/; https://www.bestlaminate.com/roberts-super-felt-premium-underlayment-100sf-roll/ and https://www.bestlaminate.com/floor-muffler-ultraseal-2mm-underlayment/. If you have any other questions, let us know!